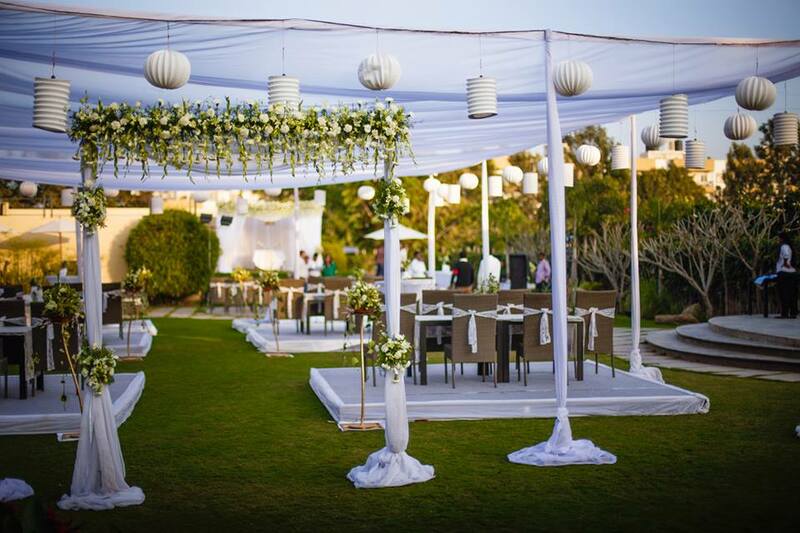 To make your wedding worth remembering, arrange it in the most sophisticated style. What you have to do is to find a classic banquet hall and leave the rest upon the organizers to do!! Indian weddings are always fabulous because of the amazing ceremonies. Indian weddings do not mean getting two people married but they mean that along with those two persons, two families are taking vows to be at each other’s side in every difficulty. Everyone of us wants to celebrate this marvelous event at a grand place, so here are the list of wedding banquet halls in Bengaluru. 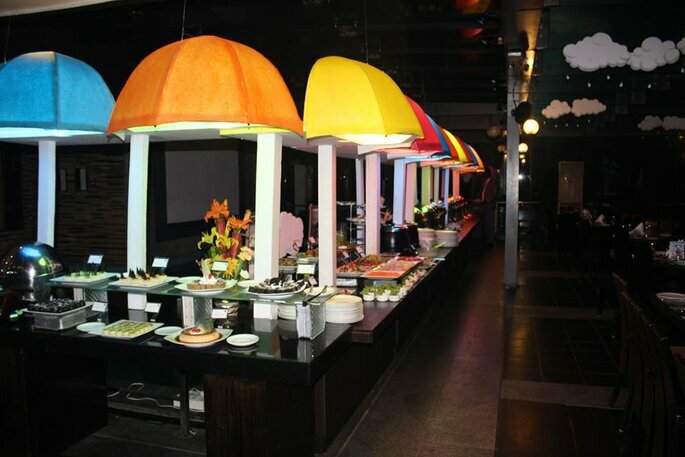 These hotels are not only sufficient for banquet halls but also suffice for your guests’ stay. So make your perfect choice at the best possible place! Lemon Tree Hotels was founded in 2002 by Patu Keswani. 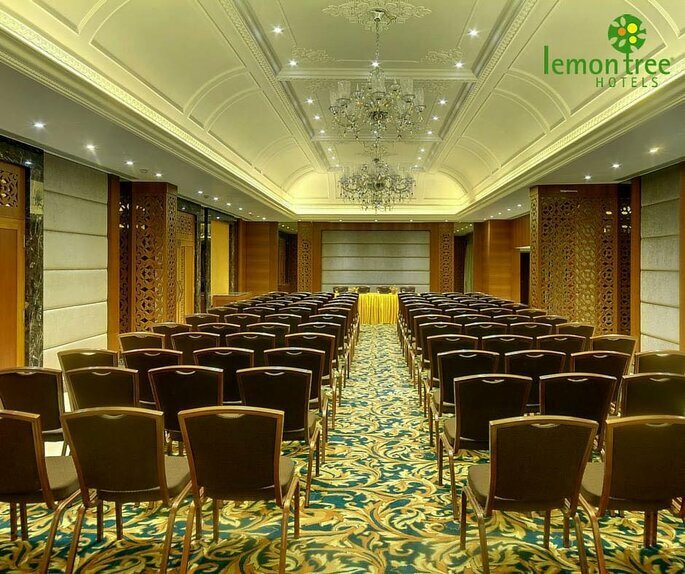 The Lemon Tree Premier brand was launched in 2010 with the opening of its first hotel in Bangalore. The company presently owns and operates 40 hotels in 23 cities with over 4000 rooms and over 3500 employees. 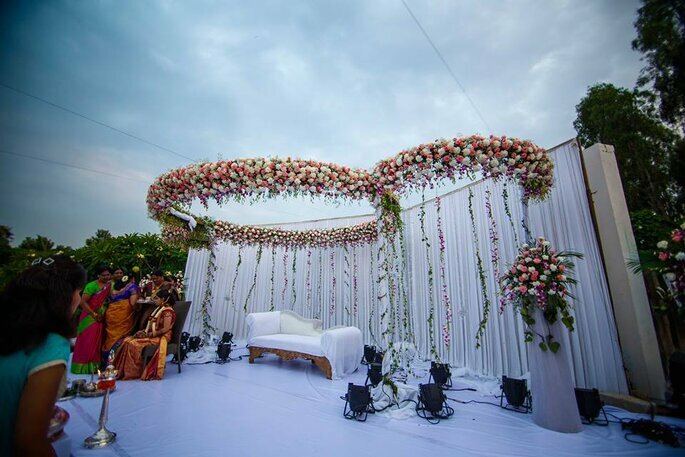 It is one of the most contemporary venues for events and weddings, with a total area of 4270 square feet. They feature everything you need, have a well appointed team of energetic and cheery staff members at your service to ensure your ideas get a fresh makeover. 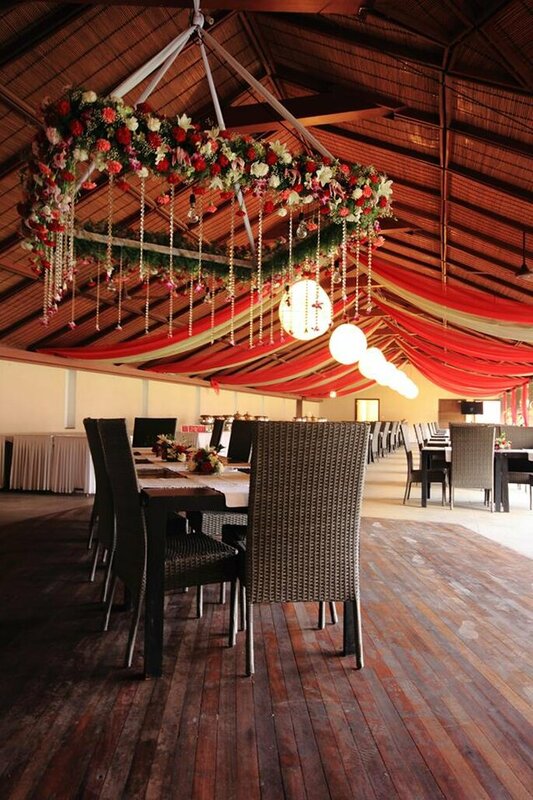 With a seating capacity of 175, it has everything you need for your wedding and nothing that you need to worry about. They are well equipped with high-speed WiFi, surround sound system, LCD projector, large screen TV and a DVD Player. The Jayamahal Palace Hotel offers a plethora of facilities for its guests to enjoy during their stay with them in Bengaluru. They have taken every measure to ensure that their guests have everything they could want, right here at the hotel! 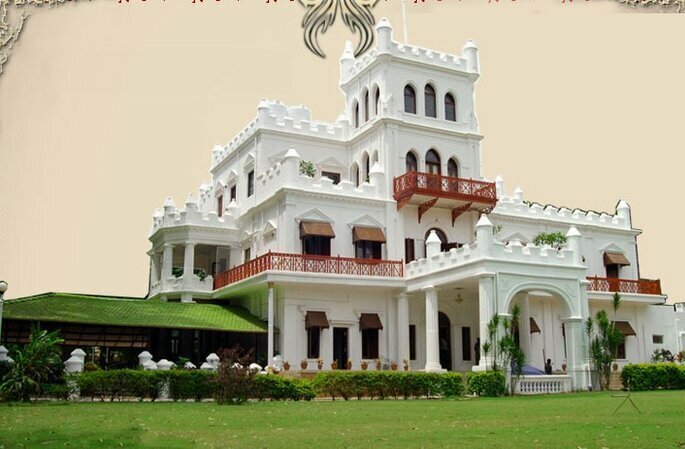 The Darbar Banquet Hall at Jayamahal Palace Hotel makes for an excellent venue for you to host your wedding as well as events. With a maximum capacity of 200 people as an audience, the hall is ideal for meetings, events, or small gatherings of people. 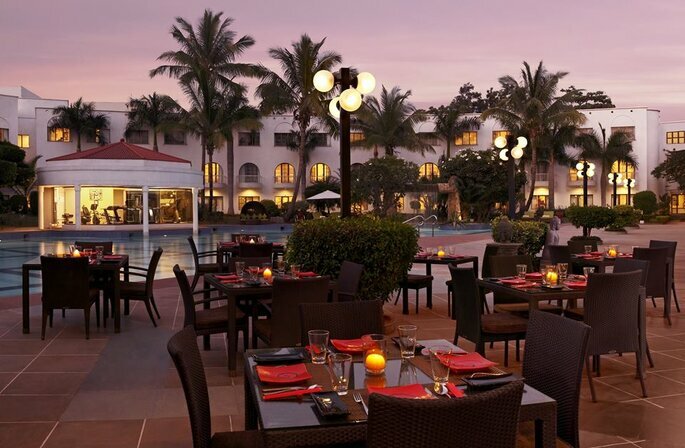 The Solitaire hotel is a 4 – star hotel, located on the race course road, the central business district of Bengaluru. 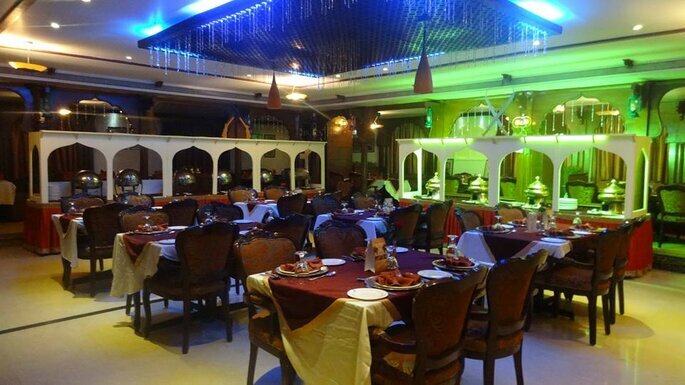 99 rooms, 1 specialty Indian restaurant, 1 coffee shop serving all time multi-cuisine buffet, a swimming pool, and a gym are the facilities of the hotel which will make your guests enjoy your wedding. Their consistency in providing world class facilities and service have made them, one of the best four-star hotels in Bengaluru. The Solitaire’s specialized facility includes all that you can boast off. The Solitaire have five banquet halls in it so the decision is yours which one you want for your wedding. Bangalore Hotels Bell and Convention Centre is a 3-star hotel in Bengaluru. It is located at arm’s length from Majestic City Bus Stand, next to Bengaluru city railway station and just 37 km away from BIAL airport. 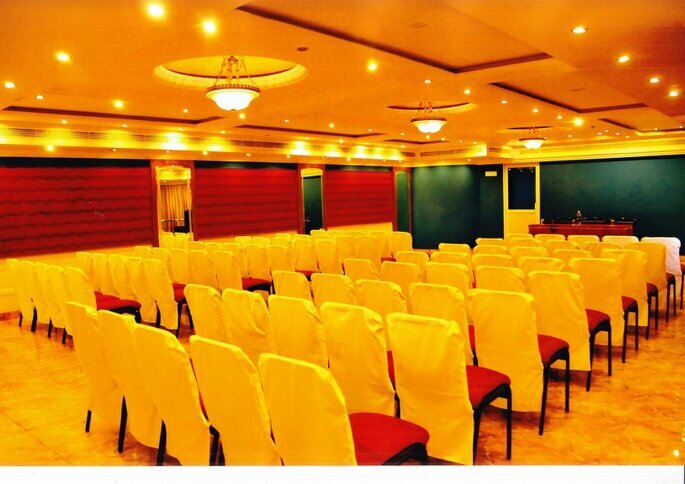 It has 72 luxuriously centralized air-conditioned rooms with 7 banquet halls like the conference halls, business meeting halls, residential meeting halls, reception halls, marriage halls, party halls, function halls, convention halls, exhibition halls for 15 to 1000 pax. The President Banquet Hall is a 10,000 sq. feet with elevated 1,200 sq. feet stage provided with 4 Green Rooms. The Convention Hall can accommodate up to 1000 pax with floating crowd of up to 2000 pax in theater style. The other facilitates include ample car parking space for up to 125 vehicles. Photo: The Bell Hotel and Convention Centre. 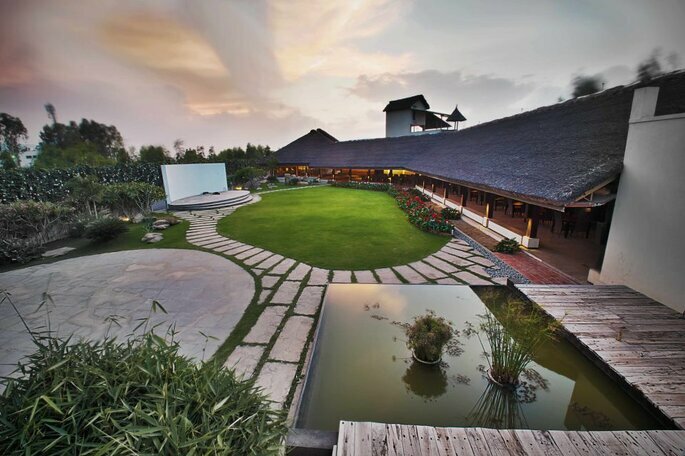 Temple Tree Leisure is a perfect blend of modern comforts and a rich, rustic ambiance. 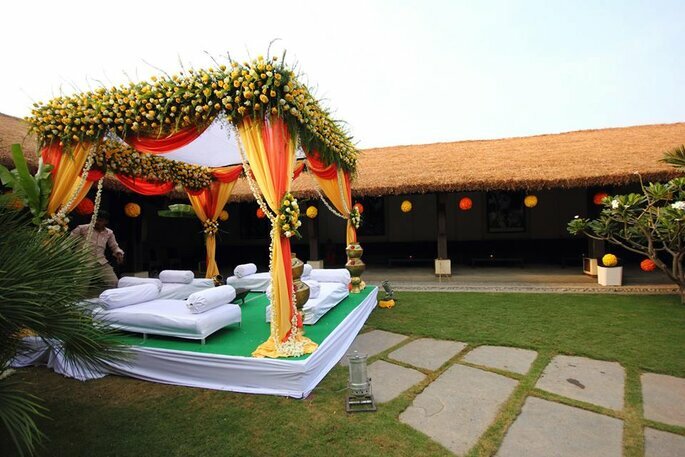 Temple Tree Leisure offers an imaginative and sophisticated environment for medium to large events. They are the ideal people for weddings, parties, corporate workshops, plays, art shows and concerts and the thing to be taken notice of is that they understand your event needs special attention like no one else does. Set in a 1,00,000 square feet pristine space with a capacity to host a little over a 100 to 1000 guests, they are easy to find and get to. Their talented and experienced staff will help you coordinate all aspects of your wedding party, making your experience worry-free from the first stages of planning up until your big day. Impress your guests with preparations that combine amazing flavor with exotic presentations and exceptional libations with any of the banquet halls in Bengaluru of your choice!